Decide where you will file for divorce. In most states, you or your spouse will need to meet a residency requirement of six months or one year before you can file for divorce in that state. Determine if you have a “no fault” divorce. In a no fault divorce, you do not have to give a reason for the divorce and can simply cite incompatibility or irreconcilable differences. In some circumstances, you may wish to give a reason for the divorce. This can be helpful in contested divorces when there are disputes over child custody or property. A judge may then take "fault" into consideration when deciding those issues. Check to see if your state requires a period of legal separation before you can file for divorce. In some states, including New York and North Carolina, you will need to live apart from your spouse for a period of time before you can file for a divorce. Determine if your divorce will be contested or uncontested. An uncontested divorce is when the spouses agree on all the issues, or have no children or assets to divide. In a contested divorce, the spouses do not agree on the issues and are asking the court to decide. Each state has different processes for contested and uncontested divorce, but an uncontested divorce is generally faster and easier to obtain. If you have minor children and your divorce will be contested, you may want to hire an attorney. Find out if parenting classes or mediation is required in your area. Some states require these as a prerequisite to divorce if there are minor children involved, even if your divorce is uncontested. Write a divorce settlement agreement if your divorce will be uncontested. This sets out the terms of the divorce and states that both spouses agree to these terms. You may need a lawyer to draft this agreement for you. File an Original Petition for Divorce. This is a legal document requesting permission from the court to divorce. It is also called a Letter of Complaint. This document should be filed with the clerk in your county court. There may be several different versions of the form depending on whether you have minor children and whether the divorce is contested. You can ask the county clerk to supply you with the correct forms for your situation. The petition will contain your requests for the terms of the divorce, such as a custody and support, and the reasons you are asking for a divorce. Serve the divorce petition on your spouse. This involves delivering the petition to your spouse. Your spouse will then generally have 30 days to respond to the petition. If he agrees to all of the terms in the petition and has signed a settlement agreement, he does not need to respond. In this case, you will be given a court date, and a judge will look over your petition and settlement agreement and grant the divorce. If your spouse objects to any of the terms in the petition, he will file a Response. The response forms are also obtained from and filed in the county clerks office. The response form sets out what terms your spouse wants in the divorce. 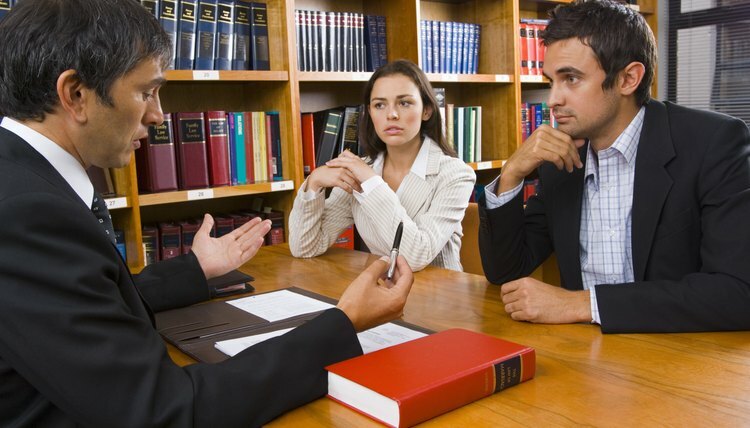 Hire an attorney if your spouse files a response form and contests the divorce. Your attorney will begin negotiations with your spouse's attorney to try and reach an agreement on the terms of the divorce. If you and your spouse cannot agree, you will be given a court date to argue your case before a judge. The judge will then decide the terms of your divorce.